My What Monotonous Stories You Tell Grandmother! 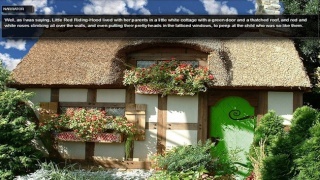 Developed by Brave Rock Games Red Riding Hood is an interactive storybook that is geared towards young children, but with only 15-20 minutes worth of content and a bare-bones presentation is the game even worth its $1 asking price? Continue reading to find out! The presentation of the game is pretty lackluster, especially for a visual novel and the narration is almost unbearably slow which is something that should be a high point for any visual novel, yet Red Riding Hood fails to achieve this. The game also features next to no interactive features which really hurts this game's overall score. Overall the game feels so boring that it's essentially broken despite there being nothing wrong with the coding of the game. The visuals of the game are quite lackluster and are essentially just photographs with cartoon style characters added to the images and the audio is equally disappointing as it's often difficult to hear the narrator as the voice is seriously muffled. 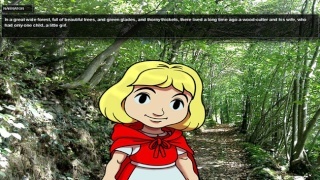 With a poor audio-visual presentation and next to no interactivity Red Riding Hood fails to provide anything more than a boring low quality ebook experience which is something that might be excused thanks to its super low price, however we just can't recommend this game to our viewers. What an awful looking game. This game sounds dreadful lol. Thanks for the review lol. I was expecting a low score from this one. Great review! I didn't have high expectations for this app and it seems that was an accurate assessment.